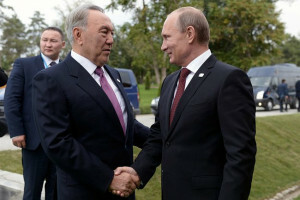 The fourth summit of Caspian states, which ended with the signing of the Joint Declaration by the Presidents of the 5 countries, as well as communiques and three agreements governing interactions between Russia, Azerbaijan, Iran, Kazakhstan, and Turkmenistan on the Caspian Sea, was a significant step towards the development of the legal status of this body of water. Attempts to develop a five-nation Convention on the legal status of the Caspian Sea as a basic document defining issues of jurisdiction over the water area and the bottom, principles of the production of hydrocarbon resources, their transportation routes to world markets, as well as issues of navigation, the use of biological resources of the sea, environmental protection, security, the fight against organized crime and drug trafficking, have been underway for over 20 years now. The process of conciliation has been slow. And here at the Astrakhan Summit they managed to formulate the basic principles that will form the basis of the Convention, which could be signed as soon as 2015, stated the Russian President. The Heads of States, due to increasing security threats in the region in the areas of military, politics, economy, and ecology have shown a willingness to compromise in the search for joint solutions. Iranian leadership considers the Caspian area one of the priorities of its foreign policy. Nevertheless it is still the Iranian position on the division of the sea that has been the stumbling block in the way of the agreements, Tehran was actively involved in the negotiation process and on a number of matters its approaches to the problems of security, navigation, fishing, protection of biological resources, strengthening of information and cultural humanitarian contacts were close to Russian. Iranian President Rouhani, summing up the meeting in Astrakhan, as achievements of the summit stressed the importance of the principles enshrined in the policy statement of equal treatment of the security of all the states and their compliance with the principle of “reasonable sufficiency” in the performance of military operations. Iran has been supporting the demilitarization of the Caspian Sea and the agreements reached are considered a step towards curbing the arms race and achieving stability. Iran gives particular importance to the absence of extra-regional forces in the Caspian Sea. Iran’s interests correspond with those enshrined in the statement of the principle of free access from the Caspian Sea to other seas and oceans. The Iranian leadership believes that an important step towards the development of the Convention is an agreement by the states on the allocation of 15-mile zones of national jurisdiction and the 10-mile national fishing zones, while maintaining most of the water surface for common use. It is known that Russia, Kazakhstan, and Azerbaijan reached an agreement on the division of the northern part of the sea on the basis of a modified median line. Turkmenistan as a whole is ready to support this position. Iran has repeatedly stated that it is strongly against such a principle of the division, as it does not meet its national interests, and has proposed dividing the Caspian Sea on the basis of equal shares. Iranian leadership has stated that it is also ready to support the idea of ​​sharing the sea. The idea of fair, equitable access to all the riches of the sea, with full freedom of navigation and decision-making by all countries and reliance on international law was voiced by the president of Iran. The Head of the Islamic Republic of Iran, in order to achieve greater interaction suggested the establishment by the five states of joint structure that would coordinate information activities involved in the fight against drug trafficking and terrorism, and also conducted many activities aimed at the development of the Caspian region. This idea is correlated with the proposals of Russia, Turkmenistan, and Kazakhstan, who declared the need to create common structures for economic cooperation or a free trade zone. However, the Iranian side proposes that the solution to all the most pressing issues in the region, including environmental ones, be combined in a single center. Tehran, as the initiator of the signing of the Framework Convention for the Protection of the Marine Environment of the Caspian Sea, constantly raises the question of the real environmental security in the development of the industrial resources in the sea. It expressed support for the idea of ​​developing a mechanism to monitor compliance with the ban on sturgeon fishing and step up the fight against poaching. The Government of moderate liberal H. Rouhani appears ready to implement all the agreements reached and to move towards further rapprochement. Iran’s expert circles are talking about the possibility of departing from the idea of percentage shares on the condition of adhering to international standards in the division and taking into account the specifics of the passage of the shoreline. However, in Iran the parliamentary rostrum has expressed other opinions, which seriously hampers the works of the diplomatic corps. Some political forces demand that the Ministry of Foreign Affairs seek control over 50% of the bottom and water area. H. Rouhani’s opponents fear that during slowing nuclear talks with the G5+1, the president may get carried too far in the “Eastern” direction and be pressured by Russia, which is willing to conclude with Iran important economic agreements, into principal concessions on the Caspian Sea. Over the past year, Russia and Iran have stepped up cooperation in the political sphere and are making efforts to expand economic and mutually beneficial contacts, which was noted by the Presidents of the two countries at a meeting on the sidelines of the summit. Opportunities for their co-operation include the Caspian region, and it is likely that the joint efforts for the implementation of development projects can be an incentive to adjust their positions and move toward further rapprochement. Elena Dunayeva, Ph.D., Senior Research Fellow, Pakistan Institute for Near and Middle East Studies, exclusively for the online magazine “New Eastern Outlook”.